There is definitely powerful imagery combined with static story going on here. Think of Keats' The Eve of St. Agnes and picture it as seen through the opacity of a frosted sangria goblet, under the relentless scrutiny of a dire wolf waiting to pounce, and then you may have something of the weird convolutions and attractions of John Everson and his Dark Arts. He should podcast these tales with eerie mood music. Check out MindWebs and see that it is so 1976, but still vital. You could go back much further, but this science fiction short story audiobook radio show, in tone and in qualia, is a long leap forward from its ancestors. It is the big break. This blog, microformats, hAtom, and every other essential wrinkle and being, psychically gather in a secluded Greenwich Village pub. It is some sort of cyber back door into quirky, literary web goings on, much more obscure and offbeat than the galactic channels opened by the upswelling paradigm shifts affected by microblogging, bioinformatics, and Ajax programming. There is something about the witty, intelligent, impoverished, and fascinating people involved in microformatting that emits a resonation quite unlike the aura of a gadget lover's fair or the giddiness of a tech conference, but, rather, more like the perning gyres of The New Yorker magazine and the Lilliput Review . End of loose subjective impressions. Look out, Superman and The Incredible Hulk, a list of invincible beasts in mythology is being compiled here: monsters that will make you quake in your spandex and shredded trousers! Though qualified and watered down for modern fantasy and role playing games, the medieval dragon was often invulnerable to physical attacks, was primordial, fearsome, and unbelievably huge, and would doubtlessly give Superman, The Hulk or Silver Surfer the business in a really quick and effortless manner. 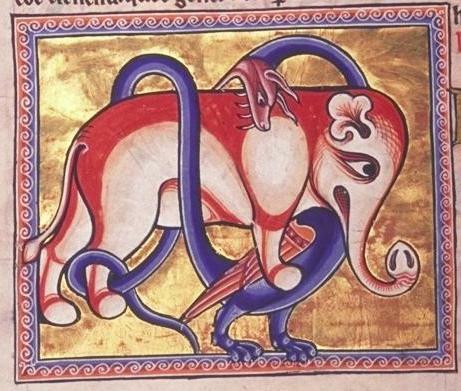 Bartholomaeus Anglicus notes of the serpent: "for to the end to slay anything, to him venom is not needful, for whom he findeth he slayeth"
And, further, from the Harley MS 4751 (Harley Bestiary): "It is harmless as to poisons, but they say poisons are not needful to this creature for dealing death, because if it has caught any one in its coils, it kills him." And, in the cascading style sheets of invincibility, the most ancient is prioritized, for it is cryptozoological, frightening, immense, and terrifying. Up next, perhaps the Basilisk, Catoblepas, or the Kraken. Interesting list that includes the truly unique Chariots of the Gods? 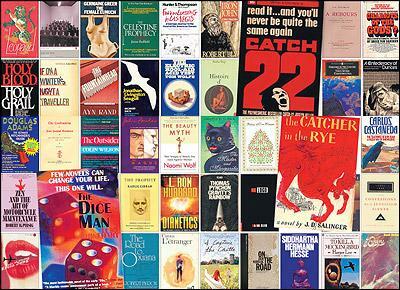 : Was God an Astronaut, Rousseau's Confessions, Dianetics, and Thus Spoke Zarathustra, along with the more predictably cult-lite and cool-cred-ified Catcher in the Rye, Slaughterhouse-Five, Siddhartha, and On the Road. Note: an endorsement of uniqueness is not an endorsement of viewpoint! Not a fan of L. Ron Hubbard and Nietzsche, though Rousseau definitely inspires. Like Vampire Hunter D this OTR show is not! 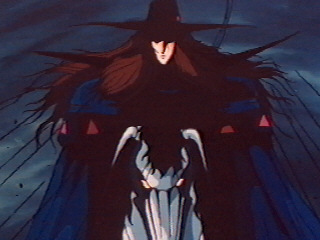 Screenshot is from the legendary Vampire Hunter D, more particularly, from the eponymous 1985 anime film, conceptually illustrated by Yoshitaka Amano. This is the type of stuff I will be interested in forever and ever. So exciting in the speculation and possibilities...whew! Link: The Cryptid Zoo: Atmospheric Beasts. Also, check out Sir Arthur Conan Doyle's tale The Horror of the Heights. It has a great retro-futuristic, early sci-fi, victorian era feel to it. 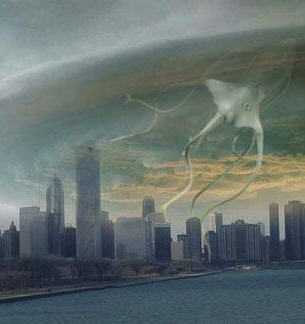 And, Wikipedia's entry on Atmospheric Beasts, Wikipedia: Atmospheric Beasts, has good information and several links. Just finished this fascinating book and instead of analyzing plot, structure, characterization, and imagery, I am analyzing whether I may have a very mild form of Aspergers Syndrome...minus the super-antisocial and violent tendencies. I hardly ever get an urge to strike someone, but I do occasionally get overcome with a compulsion to destroy a frustrating piece of equipment or gadgetry. It is more the way that information is processed that I relate to, though this book decreased my opinion of my closeness to this condition. I don't really think anything like the protagonist, Christopher Boone. In fact, although I thoroughly enjoyed the story, I found the character a bit presumptuous, rude, affronting, and obnoxious: which is exactly what asperger websites tell you NOT to think when witnessing the symptoms, but I cannot help it. I am so anti-rude that I almost cannot excuse someone due to mental illness or exceptional circumstances. I love my dreamy lover so dearly, I cannot express it verbally, but, when she is zipping around the room readying herself for work and abruptly asks whether I have seen a hair tie, shirt, or some other sundry, I almost invariably get testy and frustrated. I wish I didn't, but I cannot help it. Due to this, my own symptom, I likely am afflicted with the yang of asperger's yin. supercharger: I like this one. gasper: not so crazy about this one. rasper: sounds cool, whether it refers to tool or voice timbre.